This technology allows the optimization of emailing and deliverability, by prioritizing some email addresses against others. Automatic delivery following a specified action (open, click or call to a web Service). In order to test your emailing campaigns and improve their results, SLIP Emailing Platform offers you the split testing. Thanks to this feature, you can test one or many elements of your emailing (between 2 and 6 campaigns simultaneously). 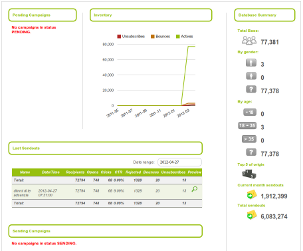 Then you can automatically send the most performing campaign to the remaining target. Create your Emailing campaign with our HTML editor and personalized them in order to target your contacts. Mobile application which allows you to monitor and follow-up your emailing campaigns. For a relevant segmentation and performing targeting, our software offers automatic segmentations according to the tags linked to the campaigns and/or according to the recipients' behavior. Statistic tools, easy to use and with major indicators: cold/hot zones, by domain/day/hour/ and by URL of the emailing campaign. This application will allow you to analyze the results of your campaigns and develop the most adapted strategic decisions. In order to ensure the best deliverability, we watch the reputation of all IPs relying on our system in real time. We are partner of the FEEDBACKLOOP programs (hotmail, Yahoo, Aol, Comcast and many more), in order to guarantee a low average of complaint rate and a healthy database. Every email sent from our platform benefits from the DKIM, SPF, SENDERID and DMARC authentications. Your senders will be protected from any phishing attempt. Manage your campaigns, databases and statistics with our API SOAP. This technology fits in many systems very easily (PHP, PERL, JAVA and many more).